The new generation of iPhones isn't only increasing in size but speed as well. Apple just announced its next-generation A8 processor that will be baked into the iPhone 6 and most likely future iPad Airs. Apple confirms rumors that the A8 has over 2 billion transistors and is 13 percent smaller, 25 percent faster, and 50 percent more efficient and faster graphics than its A7 predecessor. Apple is also introducing a new generation of M8 motion coprocessor that can tell you when you're cycling, walking, running and can measure distance and elevation even if you go up a flight of stairs. Should be a great addition for Apple's HealthKit ambitions. Metal, a graphics technology introduced earlier this year at WWDC, also claims to "bring console-class 3D games to iPhone," according to a press release. The A8 does inherit some traits from the A7, primarily its dual-core and 64-bit architecture characteristics, however it's manufactured with the 20nm process rather than the A7's 28nm process. Apple hardly ever gets into the spec minutiae with their processors, so we won't know the exact details until we start putting them to the test. One rumored benchmark suggests the A8 is a 1.4 GHz dual-core processor with 1 GB of RAM that focuses more on energy proficiency than raw speed. From a straight spec comparison between chips, such as the Snapdragon 805 found in Samsung's new Galaxy Note 4, under these rumored specs the A8 may not seem like a big deal. The 805 is quad-core 2.7 GHz SoC, but it's important to remember that the A8 is a custom job, built and optimized specifically for Apple products and iOS, whereas Qualcomm creates stock chips for multiple smartphones. A pure spec sheet comparison doesn't come close to telling the whole story. On a brief (but important) connectivity note, the iPhone 6 and iPhone 6 Plus now features 20 different LTE bands and support for LTE Advanced for speeds up to 150mbps. Apple's new handsets have 802.11ac Wi-Fi and are 3x faster than the previous generation. iPhone 6 will also have Voice over LTE and Wi-Fi calling through select carriers. After upgrading the iPhones brains and brawn, all that's left is its vision. Because Apple slimmed down their devices (6.9 and 7.1mm! ), they've also had to tinker with the camera module to make it fit, and even then, it still protrudes slightly on the back. The lens remains the same with just 8 megapixels but is an iSight camera with a new Focus Pixels technology, true tone flash, and a f/2.2 aperture. Focus Pixels helps the camera focus twice as fast and comes with next-gen tone mapping and noise reduction. The improved image signal sensor in the A8 makes advanced face detection possible, which means better focus. The iPhone 6 and the iPhone 6 plus will each have digital image stabilization. However, the Apple's phablet offering will also include optical image stabilization, which will help capture steady video and better pictures in low light. Concerning video, iPhone 6 and 6 Plus can take 1080p video at 30fp or 60fps. If you want to dial the speed down with the iPhone's slo-mo function, those frame rates jump up to 120 fps or 240 fps. Apple also bakes in what it calls cinematic video stabilization, continuous autofocus, and a time-lapse video feature. As for the front-facing lens, the FaceTime HD camera aperture lets in 8o percent more light and has improved face detection for when your face is filling your display. There's also an included burst mode. 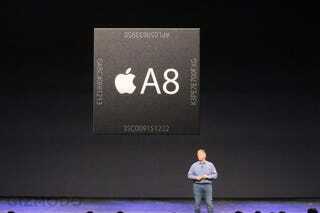 Apple says the battery powering all these chips and lenses will be equal or better than the iPhone 5s. The iPhone 6 boasts 11 hours of Wi-Fi browsing, 10 hours on LTE, and 14 of 3G talk time. However, the iPhone 6 Plus gives you more battery life along with that extra screen real estate. Apple says its phablet will deliver 14 hours of video and a whopping 24 hours of 3G talk. This could speak to the recent rumors that the 4.7-inch model's battery would come with 1,816 mAh, an improvement over the 5s' 1570 mAh battery, whereas the 5.5-inch iPhone monster will have a much larger 2,915 mAh option. Two other hardware additions include a new model option with 128GB of onboard storage for the iPhone 6 and 6 Plus ($400 and $500 on contract respectively). Tim Cook and company also put to bed numerous rumors that Apple would finally get into the mobile payments game by including NFC on their new smartphones. That answer—is yes. All the forthcoming Apple ads (and believe me, they're coming) will obviously, and maybe justly, focus on the iPhone 6's new slim exterior, but Apple isn't just about cosmetics. It's the marriage of design, software, and the impressive guts inside that holds the world's attention every September.